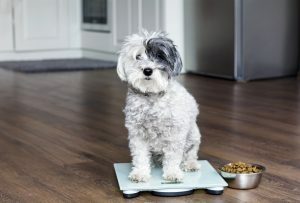 Five Steps To Managing Your Dog's Weight | Babcock Hills Veterinary Hospital, P.C. Does your dog need to lose weight in the first place? Before trying to help your dog shed some pounds, you may want to do a little research and figure out what a good weight range is for their breed. Some dogs look chubby when they’re at their healthy weight, whereas a leaner breed like, say, a whippet, may look underweight even when they’re in their ideal range. Know the right weight, consult with Babcock Hills Veterinary Hospital if need be, and set that as a target. This one will help you meet your own fitness goals, too. Your dog may love their yard, but they really, really love getting out and going on an adventure with their people. San Antonio is a beautiful place, get out there, take your buddy for a walk once a day, and get them out to the park, the beach, hiking trails and so on whenever you can. As with losing weight yourself, it’s all about consistency and discipline. It requires a change of habit. To create a wellness plan for your dog, make an appointment with Babcock Hills Veterinary Hospital today!